Whether it is a long-weekend escape to enjoy the mild weather before winter sets in or a long-awaited vacation during the peace and quiet of fall, autumn is a reliably gorgeous time to visit Grand County. Come enjoy the Fall Color in Colorado's Favorite Playground! For the best foliage viewing, we recommend the following spots in the county. 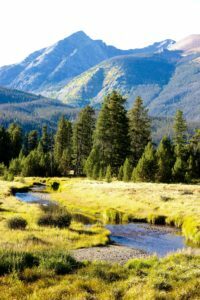 If you head north out of Grand Lake and enter Rocky Mountain National Park, you immediately enter the scenic Kawuneeche Valley, where golden willows and occasional splashes of aspen decorate the winding headwaters of the Colorado River. Bugling elk, biting trout and the occasional moose make this an ideal spot for wildlife viewing as well. Recognized as one of Colorado's 25 Scenic & Historic Byways, the Colorado River Headwaters Scenic and Historic route follows the mighty river from State Bridge to its source in Rocky Mountain National Park. In Grand County, the section from Kremmling to Granby offers an array of fall color amongst the large cottonwoods that line the stream, as well as in the aspen groves that dot the distant hillsides, particularly around Windy Gap Reservoir. The drive to Muddy and Rabbit Ears Passes in western Grand County is sure to be a vacation highlight. After a stop for lunch and a little shopping in the charming town of Kremmling, head northwest on U.S. 40, which passes through beautiful ranchland before climbing to the Continental Divide twice. Along the way, you'll see expansive stands of aspen presenting the whole spectrum of color — from lime green to rich gold. Have an evening picnic at Dumont Lake atop the pass, and keep your eyes peeled for moose. Encompassing the nearly 40-mile-long chain of 12,000-foot mountains that stretch south from Rocky Mountain National Park, the Indian Peaks and James Peak Wilderness Areas offer hikers dozens of alpine trails to explore. The payoff in fall? Pockets of aspen, a mosaic of red and orange tundra, and views of the colorful valleys from above treeline. If you like to take the road less traveled, consider Colorado Highway 125 from Windy Gap Reservoir over Willow Creek Pass to Walden. Perfect for a lazy Sunday cruise any time of year, the route is particularly scenic in fall due to an abundance of aspens along its initial stretch. For more ideas and activities for Fall Fun, Click here! To find Lodging Deals during your Fall Getaway, check out our Lodging Deals Page! Here's a great article from the Grand County Colorado Tourism Organization on top spots to seek out Fall Foliage!